I made a mini album gift for my grandma to give to her this easter. With Easter in mind I thought i would make it a special Easter memories mini book. So i took a look at ideas listed in my Easter mini book page and chose to make one in the shape of an Easter egg. All in all it was pretty quick and easy to make. The pages are not strictly uniform in size as I had to hand cut them but after they were covered in pretty papers and sanded down around edges they turned out pretty good and had a nice distressed feel. It is all held together with a book binder ring and embellished with a piece of ribbon i swiped from one of dd's Chocolate Easter bunny gifts...yes i know it doesn't quite match the album but i couldn't resist reusing it. I'm reading: Easter Egg Mini Album ScrapbookTweet this! This is absolutely adorable. I love the whole idea, and I think you're grandmama will love it too. May you and your family have a very Happy Easter. 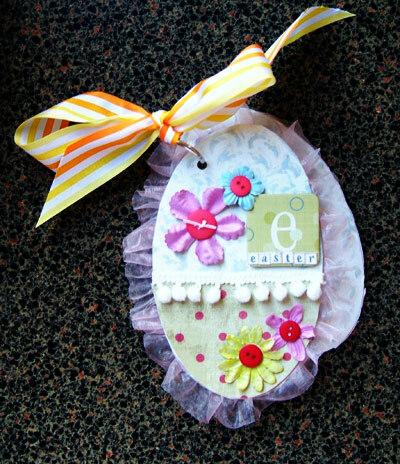 Linda E.
I love this idea for an Easter Egg Mini Scrapbook because it provides another gift idea for those other than children. The seasonal and holiday themed items are always treasured. Thanks for sharing this! You are bound to find what you like here! WOW! I love this. This is very cute and awesome. Thanks for the post.